Where can you park and for how long? Home › Advice › Where can you park and for how long? Repeater signs will be placed not more than 200m apart. The sign above indicates that any vehicle can park for 120 minutes. There could be supplementary plates giving time or vehicle restrictions, or the sign itself might indicate a parking restriction, such as this for shuttle buses. This is a vehicle-specific parking sign specifically for motorbikes. Other vehicle-specific parking signs could be for buses, heavy vehicles, shuttle buses, or disabled road users. This particular sign doesn’t display a time limit (i.e. doesn’t show P60, or day restrictions such as Mon-Fri), so it is in force 24/7. If there are no signs or lines on the road, then you can park there as long as your vehicle is parked in a safe position parallel to the kerb and not blocking a driveway. Permitted parking distances vary with the type of accessway or object. For example, while you can park 1m away from a driveway, you have to be at least 6m away from an intersection unless there are marked bays or signage saying you can park closer (i.e. where no yellow lines are marked). You also must park at least 6m away from a pedestrian crossing. Parking any closer than six metres starts to significantly restrict visibility. As vehicles exit the intersection they will have to nose out further to see up the road and this puts them in danger. Six metres is a good compromise between using all the available parking and not restricting road user’s visibility. On some intersections this isn’t an issue and you might find marked bays or a parking line closer than six metres to the intersection. The average car is around 4m long, so 6m is around 1.5 times the average car length. You can park your vehicle up to 500mm (50cm) from a fire hydrant as long as there are no other parking restrictions. However, if you want to park closer than that, or over the hydrant, then someone who can move the vehicle will have to stay with it. You will also find hydrants on footpaths and verges. Hydrants are where the fire service can get water from the mains supply. It helps when fighting a larger fire as there’s only a limited amount of water a fire engine can carry. 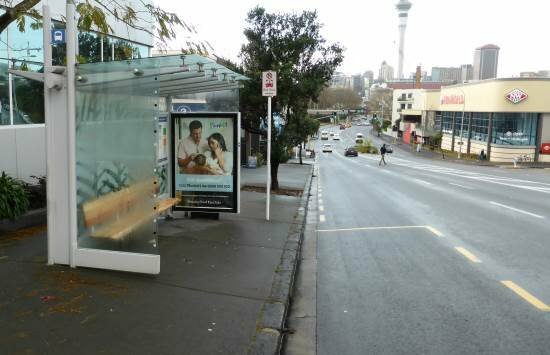 In busier streets, and where parking restrictions apply such as pay parking or a clearway, a marked box made with dashed yellow lines defines the bus stop. If there is no marked box and only a sign, then you can’t park any closer than 6 metres from the sign. Six metres gives a bus some room to pull in, and also when the bus has left and has dropped off pedestrians, the pedestrians’ view up and down the road isn’t compromised so much by parked vehicles. 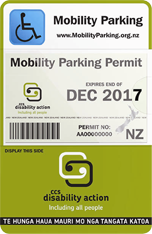 Mobility parking areas are placed to give mobility card holders easy access to places such as supermarkets, libraries, community centres, and other public amenities such as museums. They are marked with blue signs showing the direction in which the mobility parking is valid, and the time period if applicable. You can apply for a long- or short-term permit by contacting CCS Disability Action here. Long-term permits are valid for five years. Short-term permits are valid for 3-12 months and are for temporary medical conditions. A medical condition doesn’t necessarily entitle you to a permit, though. There are criteria for eligibility such as the inability to walk distances without severe pain or breathlessness, or you have to use a mobility aid; the complete inability to walk; or for some conditions where you require physical contact or close supervision to safely get around. 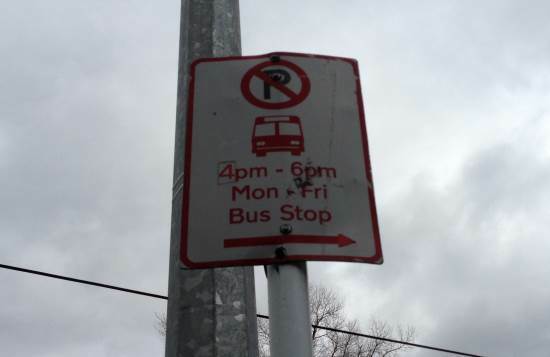 No stopping zones will be marked with a sign showing the red and blue circle and a direction. The sign could be permanent, or it could be because there are some kind of roadworks or event. You are not allowed to stop or park on a no stopping zone. There could be a distance plate underneath the sign for 1, 2, 3, 4 or 5km (shown below), or be time-restricted, e.g. Monday to Friday (shown above). If they are in areas where traffic needs to flow smoothly at certain times, for example, rush hour, the red and blue circle and the word CLEARWAY with a time limit with be displayed. You are not allowed to park on a clearway when it’s in operation. If you park in a clearway during its times of operation then your car will be towed and you’ll have to pay a towing fee to reclaim it. You can only park on the right-hand side of the road if it’s a one-way street. Vehicles have red reflectors on the back of the car to make them visible to other road users approaching from behind. They don’t have the same reflectors on the front, and therefore if a vehicle is facing oncoming traffic it is less visible. Regarding marked bays, if there are perpendicular bays, i.e. the parking bays are at a right angle to the kerb, then they don’t face the traffic in either direction. If you are parking on the right in a one-way street be aware that you will have a blind spot over your left shoulder, and that it could be difficult to see traffic approaching when you want to pull out. Loading zones are situated where vehicles might need to set down or pick up passengers, or where goods might need to be collected or delivered. They are usually positioned so that the back of the space is open to allow for unloading out of the back of a truck or van. The sign is always white on blue. In the case of the sign on the left, it doesn’t specify it’s only commercial goods vehicles that can use the space. It is for quick unloading rather than longer term parking and as long as the loading is continuing and the vehicle is attended it can remain in the car park for more than 5 minutes. If the sign said ‘5 MIN MAXIMUM’ then the vehicle would have to be moved within 5 minutes. Supplementary plates can include restrictions such as time periods (e.g. 7am – 9am, or at all times), days (e.g. Mon-Fri, or except Sunday), dates (e.g. Jun-Dec), classes of vehicle (e.g. goods vehicles only), and the number of minutes allowed (e.g. 10 min maximum). Has your vehicle been towed or stolen? Check for signage. 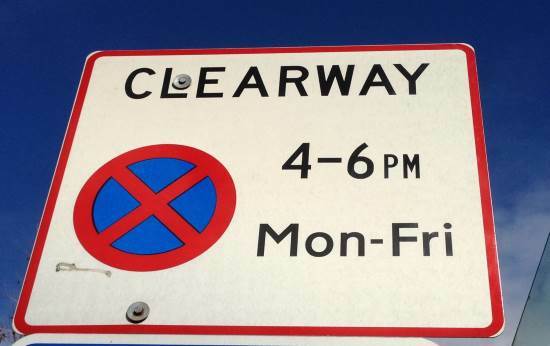 If you are on a clearway during its operation you will almost certainly have been towed. Did you park too close to an intersection or driveway? Did you park on private property? Are there roadworks? Road workers will sometimes perform a ‘courtesy tow’ where they move your car around the corner if they need to work on the road where you are parked, although sometimes they will have it towed to a council depot. You won’t be towed for exceeding a time limit unless it becomes a clearway – you will just be ticketed. If you were parked legitimately, is there glass on the ground where your vehicle was parked? If so, it’s probably been stolen. If not, then the first step is to call the council in your area and find out whether they have a record of towing your vehicle. You will need to supply your licence plate and the make and model of your vehicle. If the council have no record of it being towed, you can check with other local towing yards. If you have no luck there, report the theft to police and give them the details.